Kushum, or Kushumakaya, hosrses were developed at the Pytimarsk and Furman studs in Urals region of Kazakhstan from 1931 to 1976. They were developed largely from trotter, Thoroughbred, Don, Budyonny, and Kazakh horses. Originally, the goal was to develop, on the basis of the native Kazakh horses, a good army mount. 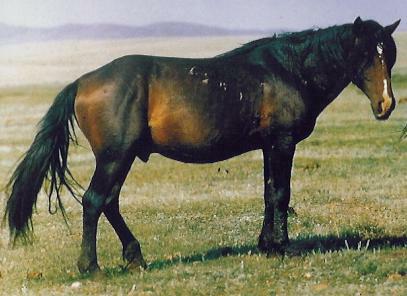 Kazakh mares were crossed with Thoroughbreds and half breeds, as well as the trotters, to obtain larger size and to improve gaits. They have a high adaptability to local conditions, which is reflected in increased weight gain in spring and autumn, which makes them suitable for meat and milk production’ their large size and live weight guarantee a high yield of horse meat. Kushum horses have the solid build of a saddle-harness horse type; their head is large but nor coarse. Their neck is average in length and fleshy. Their withers are pronounced. Their back is long and flat. Their croup is well muscled but not long enough. Their chest is broad and deep. Their legs are properly set. They are found in bay and chestnut.